Visapur FortHeight : 3038 ft. The forts of Lohgad and Visapur have played an important role in guarding the ancient trade routes and being the savior of Bhaje and Bedse caves. Among them, Lohgad is related to many significant historical events. Much of it is known. Unlike that, much less is known about Visapur. In spite of being a very big fort, protected by a highly impregnable fortification and presence of a large plateau, less is written about it, or much less records could have added to information about it. Lohgad and Visapur lay in Nane Maval. This region came under Nizamshahi after dissolution of Bahmani rule. It went into the hands of Mughals in the treaty of Mahuli, between Shahajiraje and Mughals. Seeing that the Mughals were not able to keep a control over the region, Shivaji Maharaj captured almost all the forts here till 1660. However, he lost the fort again to Mughals in the treaty of Purandar in 1665. However Aurangzeb broke the treaty. In 1682, Shahbuddin, a Mughal Sardar invaded the region, and killed 60 Marathas in an anguish. However Marathas escaped to Visapur. They were chased, but moved in time to the village of Kusapur. On 4th march 1818 Colonel Prother captured Visapur, and the next day Lohgad fell into his hands. 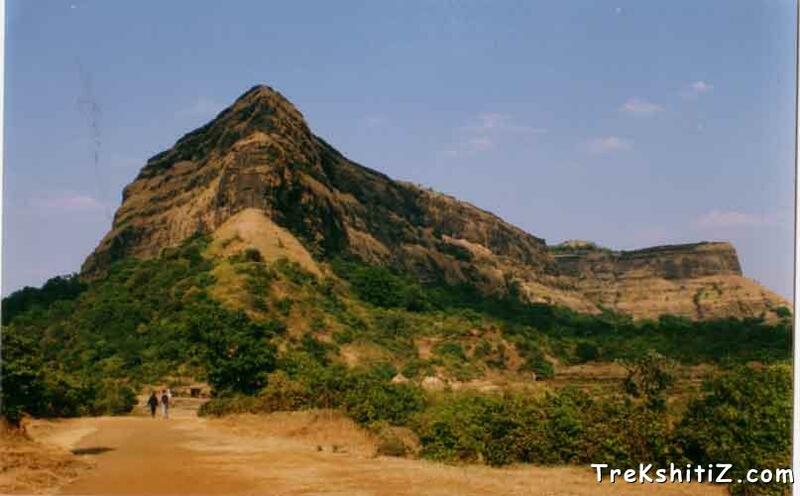 The mountain of Visapur is significant, as Bhaje caves have been carved out in the same mountain. The destruction caused by Mughals and English is clearly evident from the injuries on the Bhaje caves. These beautiful caves could have been bombarded by cannon balls, because much of their part has been broken. The main characteristic of this fort is the strong fortification built on a large plateau, to make it one of the strongest forts. A large plateau of this size is found on many less forts. It is difficult to fire cannons on the fort due to its position. We can see the injuries of destruction caused by Mughals and British on Bhaje caves, but this has not affected Visapur much. The long stretched ramparts fascinate us. On this same plateau we can see a huge stone wheel. It was used for grinding the mixture of lime, jaggery & lead. This mixture was used as cementing material for building purposes. The wheel was driven by bulls, and is the big one of its kind. Other things that add to the uniqueness of the fort are constructions like the bastion on the western side of the fort. This bastion, unlike others is completely within the main ramparts. Such a construction is rarely seen on other forts. The other remnants include old residential places. There is a fountain on the northwestern side. First route is quite confusing and we may need guide to reach the fort from the village itself. When the Bhaje caves come to our sight we leave stairways & go towards right. For walking upto15 to 20 min we come across small huts. From here the way through jungle takes us to the broken stairs. When we start climbing these stairs there is a small temple & two big caves which can accommodate about 40 people. These stairs straightway take us to the fort of Visapur. The second route is from just before Lohgaon. From here after reaching Gaimukh Khind we go towards left, which takes us to Visapur fort. This way also takes us through jungle and is much better. This must have been the main entrance, as it is in front of the main door to Lohgad. Moreover well-cut steps are seen here. The third route is from the base village named Paatangaon on the western side. Here the way is less confusing, and this joins the way on the first route. This was the way towards the trade route, and some cisterns are on this way. Also two caves and carved idol of Lord Hanuman is seen here. This way is very pleasant. There are two caves, which can accommodate 40 to 50 persons. The lake water on the fort is suitable for drinking.